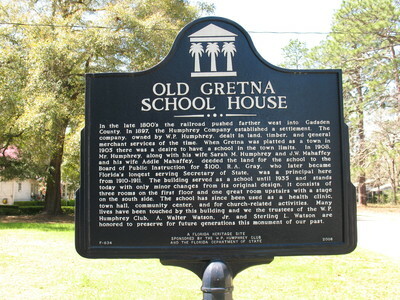 "Old Gretna School House Marker, Gretna, FL" by George Lansing Taylor Jr.
Old Gretna School House Marker, Gretna, FL. This marker is located outside the building served as a school until 1935. It is the Old Gretna School House, which was later used as a health clinic, town hall, community center, and for church related activities.
" In the late 1800’s the railroad pushed further west into Gadsden County. A settlement was established in Gretna in 1897 by the Humphrey Company. After Gretna was platted as a town in 1905 there was a desire to have a school in the town limits. One of the men who settled the area was W. P. Humphrey. In 1908, he along with his wife Sarah M. Humphrey and J.W. Mahaffey and his wife Addie Mahaffey deeded the land for the school to the Board of Public Instruction for $100. R.A. Gray, who later became Florida’s longest serving Secretary of State, was a principal here from 1910-1911. The building served as a school until 1935. Since the old school was closed, many students and teachers relate experiences and stories in loving memory of their lives at the Gretna School in times of long ago. The school has since been used as a health clinic, town hall, community center, and for church related activities. It has been a part of the history of Gretna from the beginning. Many lives have been touched by this building and we the trustees of the W.P. Humphrey Club, A. Walter Watson, Jr., W.A. Johnson, and Sterling L. Watson are honored to preserve for future generations this monument of our past." Sponsored by: W.P. Humphrey Club and the Florida Department of State. Taylor, George Lansing, Jr.; Lance Taylor; Photographers -- Florida --Jacksonville; Photograph collections -- Florida -- Jacksonville; Old Gretna School House Marker; Old Gretna School House; Humphrey Company; W. P. Humphrey; Gadsden County (Fl. ); Gretna (Fl. ); Historical marker --- Florida --- Gretna.